For other places with the same name, see Alicante (disambiguation). Alicante / Alacant  is a popular tourist city in the Valencian Community of Spain. It is the capital of Alicante Province. 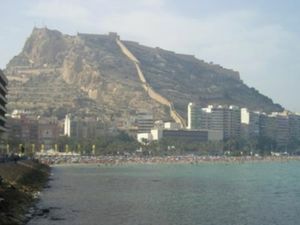 Mount Benacantil in Alicante, view from the sea. Alicante Airport  (ALC), also known as L'Altet Airport, is located 11 km (6.8 miles) south of the city centre. Alicante is served by a number of airlines including easyJet, Ryanair, Air Berlin, Brussels Airlines, Norwegian, Iberia, Vueling, Monarch, Germanwings, Aer Lingus, Finnair, Thomsonfly, Cimber Sterling, Transavia.com and Jet2.com. Bus n° C-6 connects the airport with the city . It departs every 20 minutes from a bus stop at the departure level (level +2) of new terminal. Don't get confused between the departure level (level +2) and the bus level (level -2); the latter is used by charter buses. The city bus takes about 20 minutes to the city centre, where it follows a circular route. It stops near the Alicante bus station, at Plaza Puerta del Mar, near the Archaeological Museum, next to the central market, at Plaza Luceros, and on its way back to the airport near the train station. One-way ride costs €3.85 (2015). The buses run from 6:00 until 23:00 ( and until 22:20 in the city to airport direction). . You could buy a 10-journey card for 14 euros (12 + 2 euros for the card, as of Nov. 2013) but note this card is only valid for the airport route - the city bus/tram routes are covered by a separate card. But it might still be a good idea: even a group of 2, you can almost break even in one return trip (same card can be used for many persons together). A taxi to the city will cost €20-25. Cabs can be caught at the arrival level (level 0) of the new terminal. A dozen car rental agencies including Avis , Budget , Hertz  and Europcar  are located at the arrival floor of the new terminal. The airport is only about 11 km away from the city centre. RENFE  runs a number of trains per day from Madrid and Barcelona. A ride from Madrid takes about three hours, and from Barcelona it takes up to five hours. Commuter rail connects Alicante with neighborhoods and Murcia. Suburban trains (cercanías) can get you from Elche to Alicante in half an hour. The RENFE Train Station is in the city centre at Avenida de Salamanca 1 (38°20'40"N 0°29'42"W). Alicante has a modern and still-expanding tram system . It runs along the coast of Costa Blanca up to Benidorm, from where you can connect to Altea, Calpe, and Denia by a diesel train. Railway electrification from Benidorm to Denia is under consideration. The tram service along the coast is enjoyable and reasonably priced. When going from Alicante to Benidorm, sit on the right side of the tram to get a sea view. The ticket price between Alicante and Benidorm is €3.50 (2012). In case you don't want to practise Spanish (why? You're in Spain! ), get a ticket from automatic vending machines, which are equipped with an English-language interface. If you plan to return the same working day, get a round-trip ticket right away with small discount. As always, keep the ticket until the end of journey. On some stations (including all underground stations in Alicante) you will need the ticket to exit from the system. Since September of 2011 the bus station has been located in a newly constructed building in Puerto de Alicante (barrio de Heliodoro Madrona) Muelle de Poniente, s/n (38°20'13.5"N 0°29'30.2"W). ALSA  has many lines, including to Valencia, Barcelona and Granada. Direct ferry links exist to Ibiza and Palma de Mallorca, as well as to Oran and Alger in Algeria. Book early! If you stay in the old town, most areas of interest are within walking distance. Public transportation is provided by buses  and trams . On most routes, buses run from 6:30 until 23:00. There are a number of night routes. One ride costs €1.25 (2011). Bus drivers give change. A rechargeable card for 10 rides costs €7.25 plus €2 for the card (2011). The card can be purchased at the TAM office near Mercado Central. Taxi rates are regulated  and most tourists find them affordable. TeleTaxi (tel. 965-101-611) and RadioTaxi (965-910-123) are the two largest taxi associations. Car Rentals can also be picked up from the Alicante Airport the car rental companies located inside the Alicante Aiport are Sixt , Avis, Centauro, Europcar, Record Go  there are also several car rental companies located throughout the city. On the top of Mount Benacantil at a height of 166 metres, there is one of the largest medieval fortresses in Spain, built in the ninth century by Muslims. An amazing view of town and harbour. If you feel fit, the walk from Plaza de Carmen is a sight in itself, through some narrow winding streets. If not, there is an elevator in the core of Mount Benacantil itself. The castle can also be reached by a car, but parking slots are scarce. The elevator runs from the ground level near the main road of Avenue de Juan Bautista Lafora (38°20'48.17"N 0°28'36.71"W) and stops at two levels in the castle. It may not be easy to spot the entrance! The easiest route is to follow Postiguet beach to the footbridge, then cross the road and pick your way West along the pavement until you see the sign for the castle and the tunnel entrance. Entry to the castle is free. A round-way trip by the elevator from the ground floor costs € 2.40. The ticket machine is near the end of the tunnel. Insert your money, press the large green "A" button, then "Ticket", and your ticket will be printed. Maps are provided. Traveling between the two castle levels is free. From April to September, the castle is open from 10:00 to 22:00, while the elevator runs from 10:00 to 20:00. From October to March, the castle is open from 10:00 to 20:00, and the elevator from 10:00 to 19:30. Always note the "last elevator" times at the ticket machine, though. Currently (June 2009) there is some restoration work in progress on the castle, so some areas are inaccessible and you might have to dodge some light traffic. 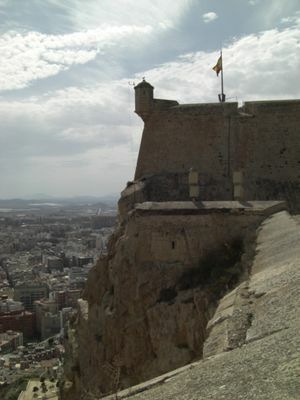 Castle of San Fernando, in the north part of Alicante center, built at the beginning of the 19th century on Tossal hill. The old town of Alicante is roughly the triangular area enclosed by the Rambla de Méndez Núnez, the Explanada de Espanya, and Mount Benacantil. Largely tourist-friendly, the old, narrow streets make for an enjoyable wander provided you don't get yourself lost. Here you'll find the town hall, cathedral, an old covent, and several art museums. The beaches are probably the reason you wish to visit Alicante in the first place! And rightly so. In the heart of the city there is Postiguet Beach. The sandy beach is popular during the day and fairly busy during the evening when it's illuminated by sodium street lights. These give the beach and breaking waves a surreal effect. You could also enjoy a game of beach volleyball at Postiguet, go prepared. With a bit of traveling (by bus or tram), you can reach a spacious 7km long San Juan Beach, which is considered to be one of the finest in Spain. Bus no. 22 connects from the old city (the Plaza Puerta del Mar / Rambla Mendez Nunez area). There are several companies near the port which offer boat trips, from 45-minute excursions on a catamaran to all-day trips to the island of Tabarca. Prices vary. One of the elaborate monuments that can be found throughout Alicante during Las Hogueras de San Juan. Las Hogueras de San Juan is the most important festival in the city. The celebration takes place in the 20ths of June. 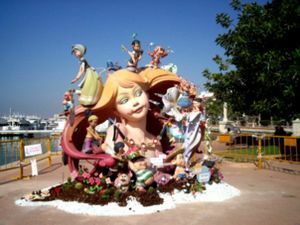 Throughout Alicante, enormous monuments are constructed and burned at the end of the festival during the night of 24th to 25th. After that, a week of night fireworks continues in the beach. Other celebrations include Carnival (in February-March, just before Lent) with parades of people in disguises and open air concerts (yes, weather allows it! ), Holy Week (with parades of religious brotherhoods with their images of Jesus Christ, Holy Mary and so on) and Santa Faz (second Thursday after Good Friday) where a massive pilgrimage/walk to a close village where a relic with and image of Jesus is veneered. As in the rest of Spain, in the Epiphany (January the 6th) there is a parade in remembrance of the Three Wise Men that adored Child Jesus, where every child participates (it is the equivalent to Santa Claus in the Spanish culture). In October is the Moros y Cristianos festival in various small towns around the Alicante region. The festivity keeps memory of the Reconquest of each town by Christian kings of the territory from Islamic forces. Locals dress up in colorful costumes as Medieval Moorish and Christian warriors and knights. Live camels and elephants can sometimes be seen in street processions. In some areas, temporary wooden castles are built and mock battles are waged. Loud gunpowder arquebuses are discharged into the air, and fireworks can last late into the night. Don Quijote  Spanish school in Alicante is a great school where you can take 4-6 hours of courses a day. All courses including beginner courses are taught entirely in Spanish. University of Alicante offers a variety of courses, including intensive Spanish classes for foreigners. Estudia Espana offers a selection of quality, affordable private Spanish language schools in Alicante. Courses for all levels and budgets all year round. There are market stalls along the Explanada d'Espanya selling beads, clothes, flags etc. If you want to see how the locals shop, head into town down the Rambla de Méndez Núnez then turn West on the Avenue de Alfonso El Sabio, and you'll find the city's main market, the Mercado Central de Alicante (38°20'52.5"N 0°29'9.6"W). It is open until about 14:30 or so most days, the two levels sell all the fresh meat, seafood, cheeses, fruit and vegetables anyone could need. If you exit the market through the back, you'll find the flower sellers in a small outdoor square. As with the rest of Spain, breakfast is usually light, usually some sort of bread (e.g. toast) or piece of bakery. Traditionally, a hearty meal in the early afternoon is followed by a siesta as the heat builds. Many restaurants are then closed between 4-9pm. A light meal is taken once the sun goes down, often in the local taperia if you are a visitor. A lot of restaurants don't open before 9pm for dinner, so bear this in mind when planning your dinner schedule. As elsewhere in the region, seafood and rice dominates, with paella in the frontline. In almost every restaurant, you will find a "menu of the day" or a similar special for €10, a three- or four-course meal with or without a drink. This is an excellent way to economise if you want to splash out later. In tourist areas, you'll have no problem finding UK fare served at earlier times, if you find yourself intimidated by the local cuisine. Go around Calle Castaños (near the Theatre), Calle San Francisco and Calle Mayor (near Saint Nicholas Cathedral) for hubs of restaurants of the whole price range. Visit places such as Nou Manolin (calle Villegas near the Theatre), Darsena (in the port area) for exuberant dishes both at the restaurant table or in the bar. Alicante has its own regulatory wine council . Tinto Alicante and Moscatel Alicante are the most known varieties. Nightlife is concentrated in Old Town, called El Barrio or El Casco Antiguo, with dozens of bars and clubs along the narrow streets. Another focal point is the eastern rim of the marina, called Puerto, in and around the casino, where things start and end later. The city provides free wifi to everyone in a number places across the city centre, including Plaza del Ayuntamiento, Plaza de los Luceros, Plaza de la Montañeta, as well as at the Santa Barbara Castle, and at the Postiguet beach . In addition many, if not most bars and cafeterias offer free WiFi. Just ask and you will be given a password. Even 321Wash, the laundromat next to the central market offers it, although the password is hidden from public view. It's written on a blackboard by the change machine. The Canalobre Caves  is a big cave with impressive stalacites and stalagmites. It is located just 24 km north of Alicante, 40km south of Benidorm, close to Busot. The inner aspect of the cave, with one of the highest vaults of Spain, is very similar to the one of a cathedral. Visitors are able to admire the diverse and capricious forms that have been taking rocks: candelabra, animals and multitude of spectacular forms. Sometimes, their superb acoustic and environmental conditions take advantage of for spectacles in which music is privileged protagonist. Entrance requires you join in on a tour (which was mainly in Spanish on a visit in October 2010, though some information provided in English). Sept 16th-June 30th: Mon-Fri: 10:30am-4:50pm, Sat-Sun: 10:30am-5:50pm. Novelda  is a town 28 km far from Alicante, that has plenty of interesting landmarks: the modernist house-museum, the Sanctuary of Santa María Magdalena, El Castillo de la Mola, and several natural salty lakes. Elche Just 23 km far from Alicante is laying Elche, famous for housing the biggest European forest of palms. This page was last edited on 6 March 2019, at 22:23.